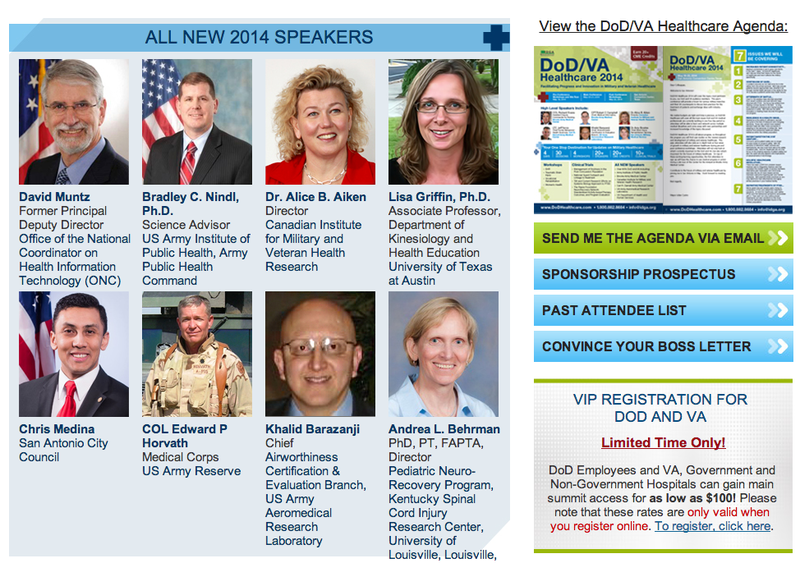 EasyID is a Proud Sponsor of the DoD/VA Healthcare 2014 Trade Show. Both Kate Fox, Account Executive Sales/Marketing, and Enoch Seward, VP of Technical Operations, will be attending the DoD/VA Healthcare Trade Show this year. They invite you to see the latest solutions in Patient Identification. The completion of a DIACAP assures our products are thoroughly vetted and approved for use by ALL BRANCHES of the Military. Our Wristbands, Labels, Forms and Mobile Applications bring affordable and safe Patient Identification to the point of care to make your job easier and more enjoyable. Note - DoD Employees and VA, Government and Non-Government Hospitals can gain main summit access for as low as $100! Please note that these rates are only valid when you register online. To register, click here. This year's conference will provide a forum for various military branches and their VA counterparts to discuss best practices for the treatment of patients and exchange ideas with industry leaders. They realize budgets are tight and time is precious, so DoD/VA Healthcare will cover all the main issues DoD and VA medical professionals are currently tackling in a one four-day period. Attendees will be able to learn and network across multiple medical disciplines and come away with new partnerships and increased knowledge of the topics discussed. DoD/VA Healthcare 2014 is all about progress, so throughout the program they will feature case studies on the newest research and development of military and veteran healthcare. This year, they will also take an in-depth look at four areas of growth in military and veteran healthcare during our pre- and post-conference workshops. They'll not only look at what's currently important to the DoD and VA, but also what's important for the future of military healthcare.